The Saratoga area offers a wide range of excellent restaurants, coffee shops, delis and pubs to suit every type of dining experience. From elegant gourmet meals, to casual pub fare, to bakeries and delis, you'll discover a full menu of options! Looking for a cultural experience? Saratoga offers rich and flavorful experiences in both fine and casual settings, whether you prefer French, Indian, Caribbean, Mexican, Italian or Asian. Looking for ambiance? Enjoy a delicious meal overlooking the lake or dine by candlelight in a classic, historic setting. When the whole family is hungry, our extensive list of Saratoga restaurants includes many that are family appropriate and easily navigated with small children. For light dining, browse our list of delis and coffee shops, perfect for enjoying fresh sandwiches, wraps, salads, and really great coffee! Planning an event that requires catering? Everything will be just the way you want it with experienced and professional caterers who know how to make it happen! 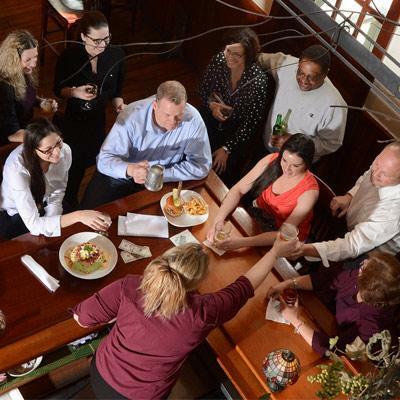 The Saratoga area offers a full menu of dining experiences to suit every taste and budget: be sure to get a "sneak peek" at what to expect in our dining reviews section. Begin your evening at one of the area's many happy hours! Wind down after a full meal at a jazz club or dance the night away at one of the many unique and exciting bars and pubs in Saratoga Springs. However you like to spend a night out on the town, you'll find it in Saratoga!